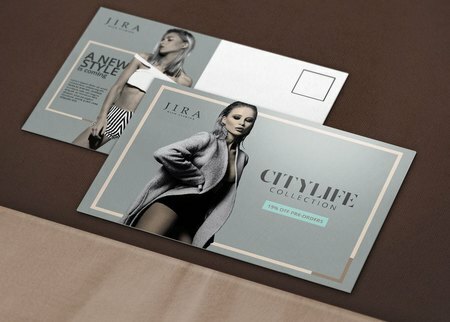 Let customers feel the luxury of your brand in a soft and smooth velvet postcard. Create postcards that are soft to the touch and bear a message that lasts. The comforting suede-like surface lets customers experience what you have to say. Our velvet soft touch postcard printing services let you customize your order according to your preferences. Velvet soft touch postcards combine a suede-like scuff resistant lamination with the durability of 16 pt. cardstock. You end up with an extra thick and substantial 19 pt. material that endures multiple handling and transfer. Complement the smooth, elegant suede-like surface with a spot UV coating on specific text or images. We offer several sizes that include the standard 4" x 6" and 5" x 7" to larger dimensions at 6" x 9" and 6" x 11”. Whatever you need to say, you can create a card with enough space for your message. Ensure your artwork is formatted correctly for printing by using our velvet postcard layout templates as a guide. Choose from our many free layout templates in EPS, JPG or PDF formats for front and back side.